Combine broth and water in a shallow saucepan and bring to a simmer over medium heat. Add lemon juice, scallion and carrots. Reduce heat to low, cover slightly and cook carrots 8 to 10 minutes or until you can just barely pierce the carrots. Add potatoes, cover slightly and cook 8 to 10 minutes or until potatoes are almost tender. Add zucchini and garlic. Cover slightly and cook 6 to 8 minutes or until zucchini is crisp-tender. Stir in thyme, parsley and peas. Season to taste with salt and black pepper. Keep warm. Generously season halibut on both sides with salt and black pepper. Brown the halibut fillets for 2 to 3 minutes per side. Add the butter to the pan and when the butter melts, tilt the skillet toward you to pool the butter. 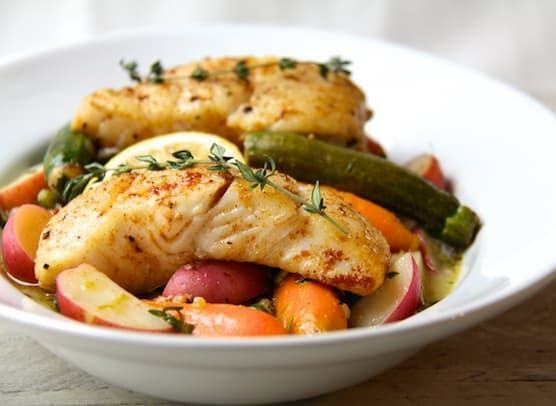 With a large soup spoon, begin basting the fish constantly with the bubbling butter for 5 to 6 minutes, returning the pan to a level position over the heat several times to keep the pan evenly hot. Serve over braised vegetables and drizzle with butter from pan if desired.